"If man is 5, Then the devil is 6"
The Central Park Concert (2003), Live At Red Rocks 8.15.95 (1997), Under The Table And Dreaming (1994), Recently (1994), Live In New York City (2010), Live Trax Vol. 3: Hartford, CT August 27, 2000 (this album) (2005), Live Trax Vol. 7: Hampton, VA December 31, 1996 (2006), Live Trax Vol. 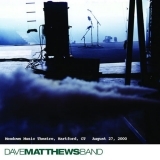 5: Rochester Hills, MI August 23, 1995 (2006), Live Trax Vol. 6: Boston, MA July 7-8, 2006 (2006), Live Trax Vol. 9: Las Vegas, NV March 23-24, 2007 (2007).